I finished the bike seat cover this morning and I am really happy with the way it came out. I changed the pattern a bit to fit my bike seat and I ended up putting it on inside out because I prefer the bottom side to the top. I am going to make a green one for Philip's bike. Following the bicycle theme, the Vogue Knitting from Winter 2004/2005 contained a pattern for a bicycle bag that I want to make from an old sweater I found in my dad's attic. The sweater is knitted in fair isle with 4-5 colors so it will be a bit of a chore to frog, but the yarn is the perfect gauge and more than I need. I am about to leave town for two weeks and I want to use my time to work on another project so hopefully I will start on this when I get back. I'm lovin the Red Heart Soft Yarn, aren't you? All acrylic yet not plastic-y. The seat cover is grand! I knew there had to be another vegan knitter out there that loves orange. Nice to meet ya. i'm thinking about starting up a TBtK reader gallery. i'll be sure to be in touch. I love this post. I've had the Vogue pattern bookmarked since it came out, but I've never even thought about a seat cover! this is such a cute saddle cover! do you by any chance still have the pattern...or know where i could purchase it? i can't find anything current! would you still happen to have this pattern? or know the link? 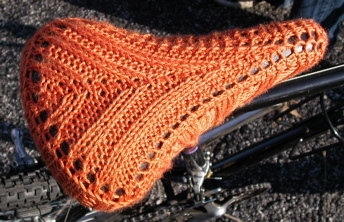 i can't seem to find it anywhere :) would love to knit one for my bike (which i will be using on my wedding day to get from the church to the reception:)) appreciate the help!